The euro has been in a disadvantageous position over the past two weeks as Italy tipped into recession at the end of last year, while the ongoing Brexit drama continued to restrict buying interest for the currency. Concerns have been also growing in Germany, where the third quarter saw the biggest EU economy contracting for the first time after four years, with investors anxiously waiting fresh GDP growth readings out of the country on Thursday to determine whether the economy is in a downturn. At 0700 GMT on Thursday, preliminary GDP growth figures out of Germany are expected to reveal a positive but minimal expansion of 0.1% q/q in the last three months of 2018 versus the negative 0.2% registered in the previous quarter, with the economy dodging a technical recession in such a case. Compared to the same period last year, though, it seems that some weakness is evident as analysts predict growth falling from 1.1% to 0.9%, marking the lowest rate since the end of 2013. Since a stringent emission testing took effect on all car registrations on September 2018 under the Worldwide Harmonized Light Vehicle Test procedure, the German leading industrial sector came into struggle. Industrial production declined in every single month in the fourth quarter and new factory orders tumbled in November and December, while in January the manufacturing Purchasing Managers Index (PMI) crossed below the 50 line which separates expansion from contraction. The US-Sino trade war was double trouble via tariffs on exports produced in the US and falling demand from the slowing China – China is still a key buyer of German cars. The Brexit story is another discomfort for high-tech German centers given the higher costs car makers would have to pay in case of a hard exit. 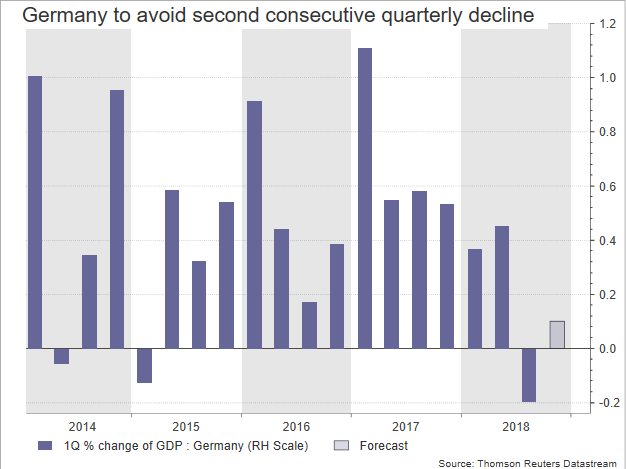 While last week’s preliminary Eurozone GDP growth data appeared in line with forecasts, indicating a much weaker expansion in the fourth quarter, an unexpected second consecutive quarterly decline in Germany could be a nasty shock for the European Central Bank. Policymakers had long prepared markets about the end of the asset purchase program in December and have already set a timing for a rate hike after summer 2019. But with two major EU economies dipping into recession at a time when Brexit and trade conflicts remain unsolved, the Bank could judge that monetary policy should turn more supportive to prevent negative effects from spreading to the rest of the Europe. Still, it would probably be wiser to wait and see how conditions will evolve in the first quarter of 2019 before releasing more stimulus. Should the UK leave the bloc without a deal and a new exchange of import tariffs occurs between the US and China, the ECB could take additional actions other than reinvesting maturing bonds. In FX markets, the toxic cocktail of risks mentioned above and the dollar’s resilience, pressured EURUSD to a three-month low of 1.1256 on Tuesday. Another negative quarter for the German economy could resume the sell-off towards that trough, while lower, the price could retest the 1.1213 low registered on November 12. If the downside continues, support could be next found around the 1.11 level. Alternatively, a stronger-than-expected German economy could help the pair to climb until 1.1350. Higher, a break above the 1.14 round level and therefore above the 50-day (simple) moving average (MA) could see resistance coming between 1.1450 and 1.1500. 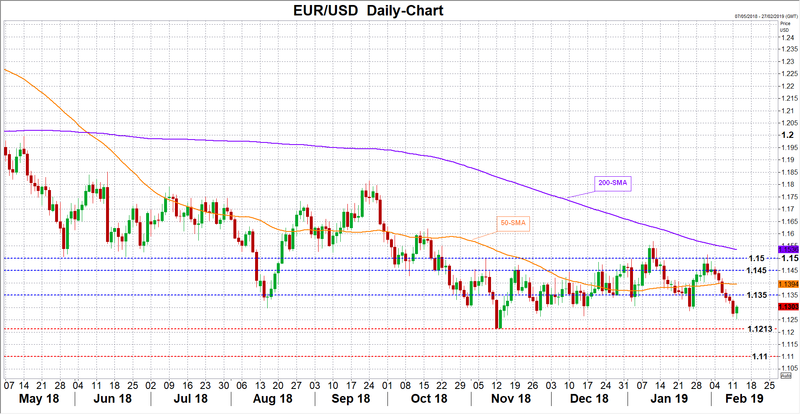 Yet only a close above the 200-day MA currently at 1.1536 would improve confidence in the market. Note that eurozone industrial production data for the month of December are due for delivery on Wednesday at 1000 GMT, while on Thursday second Q4 GDP growth estimates will be separately released along the German GDP figure.